This chapter will focus on preparing the basic foundations of your database. It will deal with an existing virtual company’s data structure and the making of SQL and tables in MySQL. This chapter will develop the environment of the project while at the same time introducing Sencha Cmd. 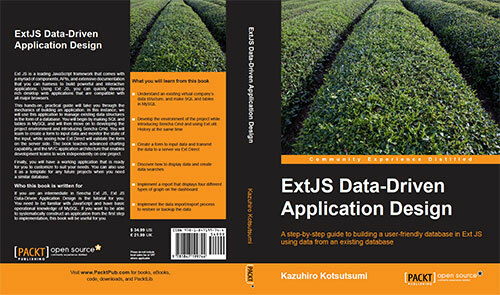 You will learn to design a simple application and optimize Ajax requests in order to use Ext Direct and Ext.util.History to control the screen with URL. This chapter will discuss making a form to input data, then transmit that data to a server via Ext Direct. You will also learn in this chapter to monitor the state of the input and learn how Ext Direct will validate it on the server side. This chapter is mainly about displaying data that was read in Chapter 3. However, users will no doubt want to search the data, so this chapter will also introduce data searches. This chapter will focus on the implementation of the report displaying it with four different types of graph on the dashboard. This final chapter will focus on the implementation of the data import/export – done to restore or backup the data.